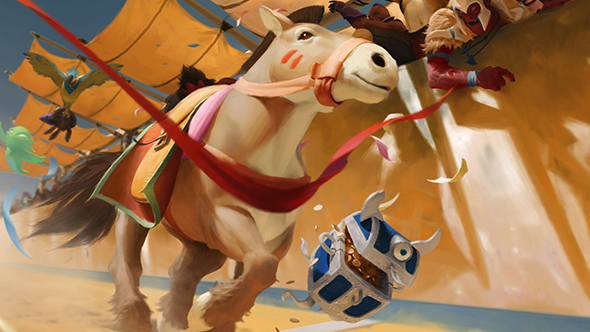 Artifact, like most digital card games, has a strong focus on competitive online play. It seems that will be to the exclusion of single-player content, according to our meeting with Gabe Newell at the reveal event earlier today. Check out everything we know about Artifact, and stay tuned for updates coming soon. There will be no single-player campaign for the game, Valve have confirmed. That’s not altogether shocking, but with games like Gwent are set to add substantial solo story modes there might’ve been a hair of hope that you’d be getting a standalone fix from Valve, yet it seems that’s not to be. However, Geoff Keighley’s earlier hands-on time with the game has confirmed it will allow you to play AI matches, so you won’t be entirely out of luck when the internet’s strategies completely outclass yours. The game’s still on track to release in 2018, and won’t be free-to-play. Stick around for more details on what exactly to expect from Artifact.